xxxx during the Barclays Premier League match between Crystal Palace and Chelsea at Selhurst Park on January 3, 2016 in London, England. So, this is the Chelsea that’s seemed to be lying dormant all season. 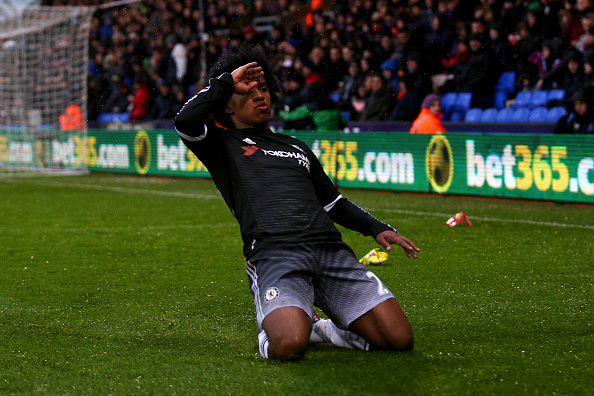 On a wet afternoon at Selhurst Park, the Blues produced a performance that was reminiscent of the Chelsea side of last season, winning 3-0 over Crystal Palace. All season, Chelsea have seemed to make tough work of any opponent that they’ve faced, and Palace looked to be another stern test, particularly away from home. Palace entered the match on a six-match unbeaten run in the Premier League and sat fifth in the table. With Chelsea languishing in the bottom half of the table and playing nowhere near their best, it would be understandable if some of the Chelsea faithful didn’t have some thoughts of impending doom, given the defeat to Crystal Palace earlier in the season. And the start of the match did nothing to allay some of those fears. From the start, Palace started brightly and showed a bit of pace and sharpness in their play, despite the absences of Bakary Sako, Yannick Bolasie, and Yohan Cabaye, and things didn’t improve when Eden Hazard limped off with a groin injury just 15 minutes in, depriving the Blues of their reigning player of the year. However, Chelsea began to galvanize, and some of the key figures who had been underperforming this season began to find some form. Diego Costa started finding space to run in behind, and Oscar and Cesc Fabregas began to run the show, possibly liberated by the presence of John Mikel Obi as the holding midfielder. Those four would combine for the opener on 28 minutes when Fabregas turned back the clock to last season, finding Costa will a defence-splitting ball. The Brazilian shaped to shoot but instead cut the ball back to a late-arriving Oscar for the simple finish and nerves began to settle in the Chelsea ranks. But Chelsea failed to capitalize on their advantage in the first half, and Crystal Palace remained a threat on the break. Wilfried Zaha had an excellent chance to equalise for Palace when he found space on the right-hand side of the box, but he could not generate enough power on his shot and Thibault Courtois easily saved. Palace would be ruthlessly punished for not converting that chance. Just a minute later, Oscar and Fabregas would once again combine with interchanging passes. Oscar would lose the ball on the edge of the area, but it would land in front of Willian who lashed the ball into the top-left corner of the net to give Chelsea a 2-0 lead and a possible goal of the season. The 3 points would be settled just 7 minutes later through Diego Costa. The Brazilian had been brilliant all afternoon with his running and sharpness, and he was rewarded for his efforts with a goal. Willian, who had threatened all day running at defenders, created space for a cross/shot that Palace goalkeeper Wayne Hennessey could not handle, pushing the rebound towards Costa who tapped in from 3 yards. It was no less than Costa deserved and no less than Chelsea deserved, as they finally began to look like the side that romped to the Premier League title last season. With 18 games left in the season, there’s still a lot to play for, but if Chelsea begin to replicate these performances, a top-4 finish may still be possible.